The world's most advanced particle accelerator for investigating the quark structure of matter is gearing up to begin its first experiments following official completion of an upgrade to triple its original design energy. The Continuous Electron Beam Accelerator Facility (CEBAF) at the Department of Energy's Thomas Jefferson National Accelerator Facility is now back online and ramping up for the start of experiments. CEBAF is a DOE Office of Science User Facility for nuclear physics research designed to push the precision frontier ever deeper into the heart of matter. The CEBAF accelerator is based on superconducting radiofrequency (SRF) technology. 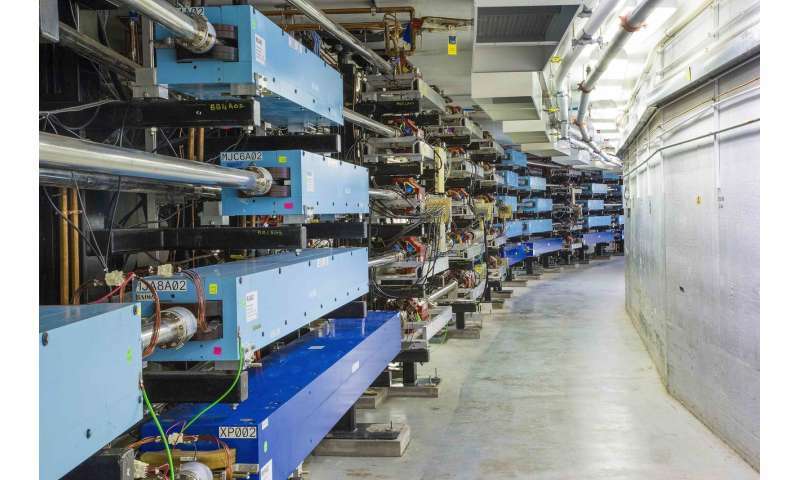 It uses a stream of electrons that are directed into four different research areas for experiments that probe the nucleus of the atom, its protons and neutrons, and their quarks and gluons. CEBAF was originally designed to provide electrons at energies of 4 billion electron-volts, or 4 GeV. The $338 million upgrade to 12 GeV was officially completed Sept. 27, 2017. Following project completion, laboratory focus shifted to the startup of full CEBAF operations for the first time since its original research program ended in 2012. The process of preparing CEBAF for experiments began in the injector, the source of electrons for CEBAF. Then, the superconducting components in CEBAF were cooled to within a few degrees of absolute zero, to 2 Kelvin, to enable full energy operations. Major systems were methodically checked and found ready to transport electrons, and work was begun to optimize the superconducting acceleration components, niobium cavities. Finally, thousands of magnets for steering and focusing the electron beam were carefully ramped up and checked. On Thursday, Nov. 30, CEBAF accelerated its first electrons through one full pass of the machine. Accelerator operators are now building on this initial success to carefully thread the beam through the additional passes as it prepares to deliver it for experiments. With each pass through the machine, the electrons gain energy. CEBAF is capable of delivering up to five passes for three of its experimental halls (A, B and C), and up to 5.5 passes for the fourth (D). CEBAF is the world's most powerful microscope for studying the nucleus of the atom. Almost 1,600 scientists from across the nation and around the world come to Jefferson Lab to conduct research. With CEBAF, scientists study how quarks interact, how they spin, and how they are distributed inside protons and neutrons. CEBAF's precise electron beams will enable the first fully three-dimensional views of the structure of protons and neutrons and groundbreaking studies of the strong force, the force that glues matter together.